I want to give credit to Andrew Weinreich for the first two of his three Predicting the Future online voting podcasts. Episode 7 (Online Voting episode 1): Can online voting defeat the broken Electoral College? What I liked is that he gives people time and space to talk, in particular in episode 8 there is lots of time given to Dan Wallach, enabling Dr. Wallach to clearly articulate his positions around online voting. As well, David Dill has an opportunity to provide his position. Where things run into problems in the Predicting the Future podcast, particularly in episode 8 about hacking elections, are in the weighing of risk and in the summation of the computer science expertise. I have seen similar disconnects in discussions about municipal online voting. Basically what happens is the computer scientist says there are risks, and the counter-argument that is presented is that there are also benefits, but this misunderstands scientific communication. What the computer scientists are saying is not that there are risks (everything has risks) but that it is not possible with current technology to adequately mitigate those risks. Basically this is a problem of estimative language, and it’s why national security agencies have entire systems to describe what they mean when they say something. Here’s an an example of estimative language from the Canadian Communications Security Establishment (Annex A of Cyber Threats to Canada’s Democratic Process). You can see similar language in Annex B of US Intelligence report ICA 2017-01D. 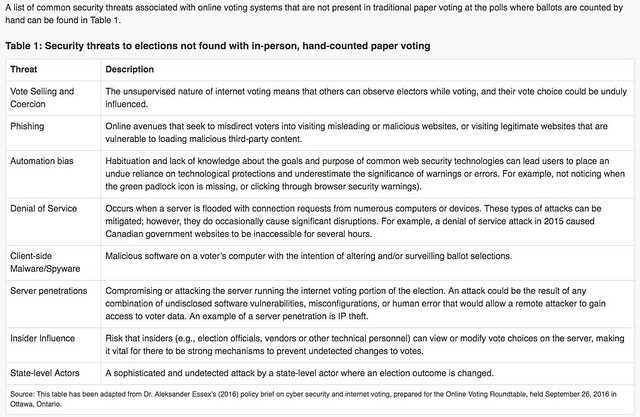 What computer scientists are saying is that compromise of online voting is Very Likely, and that there is no way to mitigate the risk below Very Likely. There is simply no benefit that outweighs an 80% or more possibility that your election results can be hacked. And that would be even if Internet voting were implemented with all possible best practices, but the evidence is it almost certainly wouldn’t be. There have been examples time and again of election technology security falling somewhere between lax and incompetent. Given that sufficiently secure Internet voting systems do not yet exist, they would need to be built. Of course, some systems, like a stone bridge to the moon, are impossible to build. Others, like a stone bridge to Hawaii, are so exorbitantly expensive as to remain a fool’s errand. which is to say, there are some things that are either currently not possible or beyond the realm of affordability. 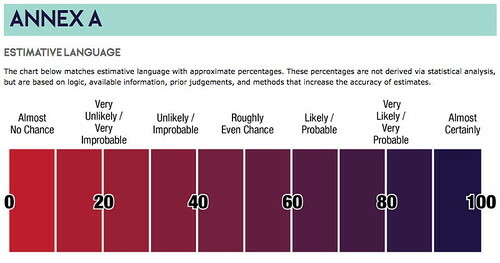 This is based on expert assessments. You may not want to believe the assessments, but that doesn’t make them untrue. Sometimes truth is inconvenient. Fundamentally, the goal of the podcast is to explore turnout. But only from a technology lens. Which is, basically, solutionism. Technology is not always a solution, and it’s definitely not always the best solution. I am ill-placed to comment on turnout in the United States, but there are two lenses one could apply. One is process design. For this I look to The epic journey of American voters. Fix the process burdens described in the Center for Civic Design’s report, and a big part of voting will have improved. Just as one example, in many countries, the state actively tries to ensure that voters are registered. For Canadian federal elections, they used to literally go door to door to ensure people were registered, in a process called enumeration. Now, checking a single box on your Canadian federal tax return ensures you’re registered to vote. The second lens is what I would call voting constraints. The US elections are not an unconstrained system in which the only thing preventing voting is convenience. There are two significant constraints imposed that could be addressed through a combination of technological and political measures: one is the (to non-Americans) absurd level of gerrymandering of districts (enabled to a large part by what one could consider misuse of technology in order to microtarget the district designs) and the other is the deliberate attempts to suppress turnout through various measures (an evolution of the Jim Crow era, in which there were constraints like voting literacy tests). If you want to talk cost/benefit, then fixing the process, removing gerrymandering and eliminating voter suppression would be (in my non-American opinion) far more impactful than online voting. Make sure you’re solving the important problems, not just the technologically interesting ones. So there are real problems, and real solutions. Now let’s come to turnout. Turnout is very complex. It depends on lots of factors including the issues, the candidates, and the political culture. It can vary from election to election in the same location. Trying to compare across countries that have very different cultures and issues is a bit of a mess. And trying to compare across vastly different sizes of elections is also a mess. The evidence is that offering online voting just causes people to shift voting channels, it doesn’t bring in new voters. I have blogged about this many times before, e.g. online voting doesn’t increase turnout. There is only online voting in municipal elections in Ontario and Nova Scotia. Voting in Ontario was extensively studied and the result is a maximum effect of 3% increase in voter turnout. As you will recall, I earlier assessed risks to online voting as “Very Likely” (80% or greater potential for compromise). So if you want to do an apples to oranges comparison, you’re basically looking at 3% turnout increase in exchange for adding massive risks to the integrity of your voting system (in the shift from paper ballots to online voting). Let’s be blunt: Estonia is a small country. The total population is about 1.3 million. The idea that we can trivially generalise from Estonia to Canada (30 times the population) or the US (300 times the population) is at best dubious. In any case, Estonia provides all of its turnout numbers. This gets presented in different ways according to the biases of the presenter. I can, for example, use the numbers to say that after 8 years, less than a third of Estonians use online voting. I can also say that Estonia’s turnout, with the magical boost of online voting was… only up 2.3% over 8 years and was lower than Canada’s completely paper-based turnout in 2015. Plus which, let’s be concrete about what less than a third means in real numbers of voters in Estonia. It means approximately 176,000 votes cast online. Do we seriously think countries are so interchangeable and voting cultures so universal that we can generalise from about 176,000 online votes in Estonia to about 128,000,000 votes in the last US Presidential election? This is not about scaling up, this is a mouse and an elephant. They’re not comparable. And that’s setting aside the fact that the Estonian e-voting is not secure and that it relies on a every citizen having a national digital ID, which is spectacularly unlikely to ever be the case in the US. As the only country with national online voting, I understand why Estonia comes up again and again, but let’s be realistic about the fact we’re talking about a system that 70% of the country’s voters don’t use, and that only represents 176,000 votes cast anyway. Switzerland has voting in some municipalities in some cantons (not national or even state-level voting by any stretch). 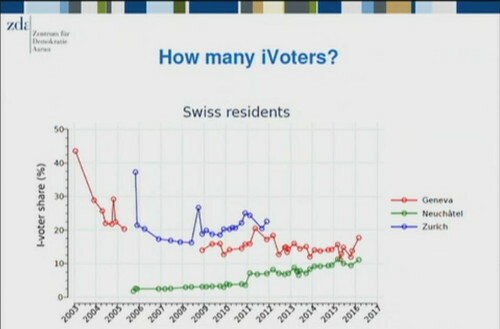 Switzerland also has no culture of voting privacy (traditionally voting was done by show of hands, and in fact in many municipalities this is still the norm) and it has much more frequent votes on more things. We are again talking about a small number of votes cast online (less than 300,000). And we’re talking again about less than 25% of voters choosing to vote online. And, as always, it doesn’t increase turnout anyway. And in Switzerland one of the systems had to be removed because it was determined to be insecure. Mostly we have small examples. Without exception, the increases in turnout are between miniscule and nonexistent. These are based on long-term, serious, analytical academic studies. The evidence is in. Online voting does not increase turnout. I give lots of credit to Andrew Weinreich for doing really diligent and comprehensive research and for letting his guests clearly express their opinions. This misrepresents the computer science position (which is incidentally a consensus position of the 96,000+ member Association of Computing Machinery). The computer science position is that based on known risks and known results (including the cases I have presented above), the risk is too high and the benefits are minimal at this time. And that the properties of paper ballots cannot be replicated online. This is an expertise and evidence-based conclusion. The computer science position is that this is an interesting problem, and one worth continuing to research. And indeed there is active research on online voting in many different computer science departments and organisations around the world, in part because it is such an interesting and difficult problem. But we are nowhere near having a solution, so in the same way we aren’t trying to solve electricity problems by promising a Mr. Fusion in every house tomorrow, we shouldn’t creating the expectation that online voting will be workable any time soon. And keep in mind the computer science conclusions about security were drawn long before the recent incidents of nation-state cyberattacks, which take the risk to an entirely new level. You can mitigate against an amateur attack, and even against a moderately professional attack. You cannot mitigate against a nation-state funded expert attack. If the NSA wants to get into your system, they will. That’s the level of threat we now know we face. Online voting doesn’t solve any of the very real problems of voter turnout. In fact it’s so low down the list of potential solutions that when the City of Calgary wrote a 2017 report on increasing turnout (PFC2017-0259 Election Outreach) online voting was rejected deep down in an Appendix (Section 2.1 Internet voting in Attachment 3, to be precise). I admire when people want to improve their democracy, want to increase turnout, want to improve the experience of voting. But online voting is not the solution. Solve the real problems instead. They are big, and they are hard, and they are mostly political. With respect, no it wouldn’t. Evidence from all over the world shows that online voting doesn’t increase voter turnout. The people who vote online are the same people who would have voted offline. Youth turnout is low with online voting, because it is low with paper voting. In the PEI Plebiscite, with ten days of online voting, turnout for ages 18-24 was the lowest of any age range, at 25.47%. But there’s more, much more than that. Halifax has online voting. Turnout dropped by more than 10,000 in the 2016 Halifax election. In the last municipal election in 2012, 66,272 people voted by e-vote and phone (22.2 per cent of the entire vote). At the close of e-voting Thursday, the HRM registered 55,788 electronic and telephone votes. Evidence again and again shows that online voting does not increase participation, by youth or by any voting group. All that happens is that (mostly middle-aged) people who would have voted at a polling station anyway vote online. For more on Estonian Internet voting, see subsequent blog post (in legacy blog) Estonian Internet voting and turnout myths. Internet voting is seen by some as a potential solution to this trend of declining voter turnout. … While there have been some Internet voting elections where voter turnout has increased, when other factors such as the apparent closeness of the race and interest in particular contests (e.g., a mayoral election without an incumbent) are taken into consideration, research suggests that Internet voting does not generally cause non-voters to vote. Instead, Internet voting is mostly used as a tool of convenience for individuals who have already decided to vote. However, it said, there was no evidence that the trial led to a rise in the overall number of people voting nor that it mobilised new groups, such as young people, to vote. Statistics indicate that internet voting does not increase voter turnout or youth participation. Some content above adapted from legacy blog post evidence about online voting (particularly turnout). I also am suspicious of how great the gains would be in terms of voter turnout. I think most of the issues lie around motivation, not opportunity. I’m suspicious of a lot of things when people say on surveys, “Oh, I was too busy to vote”. Often, it just means, “There are other things more important to me than voting.” Okay, citizens can make those kinds of determinations. Voting is not that onerous, and I think Elections Canada has done a pretty good job in the last 20 years of improving the accessibility of the vote. There are more ways to vote than ever before. 412ERRE, Evidence, 1st Session, 42nd Parliament, 22 August 2016, 2005 (Harold Jansen).